The Mekong Delta is renowned for its floating markets which are typical of the Phung Hiep and Cai Be districts. On arriving in the Delta, you can travel by motorised boat to visit the Cai Be floating market, and experience the colourful trade of goods between their vessels. The farmers from around the region bring their goods, mostly consisting of fruit and vegetables, to the markets to sell them to local dealers. These dealers then distribute the products to shops in the neighbouring towns and to wholesale dealers from larger towns. 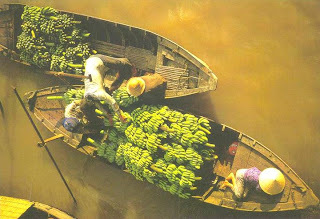 As the adjacent image indicates, wholesalers trade from the larger boats by hanging their produce from a pole. This way, buyers on the smaller boats can easily see where they have to go to purchase the goods they need. In this example we see a vegetable market. On the floating markets you not only find people buying and selling fresh produce, but you will also find floating restaurants, bars, gas stations, and many other stores. Canals in the area are simply the easiest and fastest means of transportation. 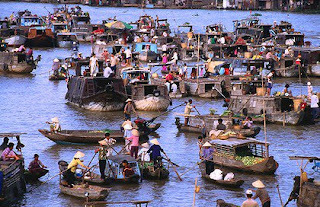 The biggest floating market in the Mekong Delta is the busy market of Phung Hiep. The market opens from 4 am through to 11 am. To visit the floating market you should stay in the Mekong Delta area, wake up early and take one of the first boats in the morning. On a typical day, you might see coconuts, mangoes, a heap of turtles, a box of snakes or even a pot-bellied pig being paddled from a riverside village to be haggled over in the floating market. 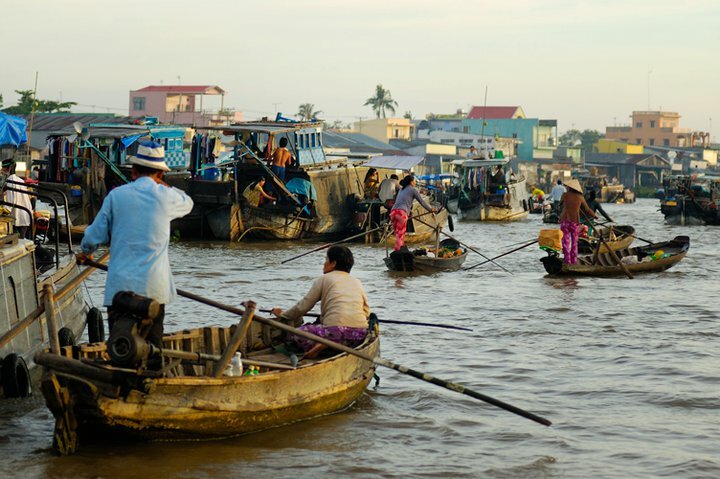 By sunrise, the waterways are clogged with the sampans of buyers and sellers. Bamboo poles hoisting various goods are numerous. Shoppers come by land and water, and as they stumble from boat to boat, they often interrupt their shopping to enjoy bowls of noodles, on open fires in the special ‘fast food’ sampans. From 3 am, rafts and boats are crowded because Cai Be is one of the biggest wholesale markets in the region. Traders live on the river and many link friends and family with boats over generations, not unlike a mobile home. On each boat, goods are hung on poles that are called dialectically “cay beo”. Hundreds of such poles point sky wards. Boats also operate like “taxis,” which are very convenient for tourists. Along the criss crossing canals, people in the Plain of Reeds take not only goods of each region to the Cai Be market but also their unique cultural characteristics, creating such a beautiful river collage.